Yes, you could argue this Nursery Room Temperature Monitor is simply an LED and an Arduino with a temperature sensor, but [Jay] really did put more thought into the process. 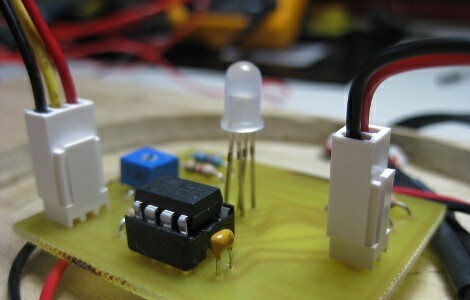 For instance he stuck with AVR, built a wooden base and sanded globe, and even included schematics and source code. Plus, SIDS is no laughing matter and the more you know, the more it can be prevented. Back on point, one thing we would add is PWM for a more gradual change in color. What would you add? Another globe connected to it wirelessly (or many globes connected to a master with LCD) to report the temperature when you aren’t in the room. This is one area you do not want to do DIY. You may think you’re smart and have everything worked out, but one “bug” and there could be serious consequences: starting a fire, false sense of security because the device fails to work, strangulation on a loose cord,…. but mostly, it is the scenarios you can’t imagine or predict. I give this build an ‘A’ for the idea, and a ‘C-‘ for not buying a robustly tested commercial product. @Sam-That is ridiculous. This only adds helpful information. If it fails there is not a higher risk of injury or damage than there already was present. Maybe judge the temperature of the baby itself via thermal imaging. I certainly hope a new Dad would put more thought into protecting a baby than what’s found on this page. blah… Well, no shiiit. He showed a simple hardware hack not a life lesson for pops world round. @Sam: Did you read the article? This device isn’t any more a fire hazard than your average cell phone charger. Also, you’d be negligent to put it within the baby’s reach…just like blind cords, keep them away from the baby and you’ll be fine. If the device does fail to work, you can fall back on the fact that you can feel “wow, this room is warm.” You are going to be in that room just as much regardless of this device, so it wouldn’t be difficult at all to judge this. There are many ways you could cross the line and put your baby at risk with your DIY contraptions. This isn’t one of them. add a humidity sensor as well maybe? alternate idea, an audible alarm when the temperature rises too high..
SIDS is not caused by temperature. And I agree whit Sam here. I have Philips avent baby monitor and its great for temperature monitoring, you can see the temperature from the remote whit numbers … + you can preset a alarm on wanted point. If you like to prevent SIDS, there is baby monitor systems for that.. but instead of temperature they monitor movement. A sensor mat is placed under the bassinet or cot mattress. If no movement is detected for a certain amount of time, for example, 20 seconds, an alarm sounds on the remote (parent) receiver. Once again, I’m not worried about the ways you think you’ve made your device safe. I’m worried about what you forgot about or failed to do. I’ve done lots of DIY projects, and they almost always require tons of testing before they work as intended. I would not leave anything in the room alone with my baby unless it has been thoroughly tested. I’m not saying commercial products are 100% safe, but they get tested by the company who made it and by the tens of thousands of parents that bought it before you. You would think that you’d be smart enough to build something as simple as a crib for your baby, but look at the crib they pulled from the market recently because of the babies that got strangled. If you used a similar design for your own crib, you’d never realize the hazards until it was too late. I’m totally fine with using your home built devices around consenting adults, but never endanger the lives of the helpless. @ nemo, If the device reports the temperature is fine, but in reality it is not, then it can cause harm. Information is only useful if it is reliable. If you make devices to monitor your baby/child and rely on them to the point where you don’t physically go in and check them with your own senses then you are stupid. Remote monitoring devices are great because they can provide peace of mind, when friends had a baby 4 years ago I gave them a wireless camera with IR LEDs and a 5″ LCD with the receiver attached to the back of it, it was a great help to them because it meant they didn’t feel compelled to constantly go and check on the baby, which meant both the baby & parents could rest in peace. But having the camera setup didn’t mean they left the baby alone completely, it was used as an aid not a substitute. You could always…I don’t know, buy a $5 thermometer and mount it near the door to check? Interesting build, but not hardly as practical as an actual quantitative thermometer. No one knows what causes SIDS. SIDS is a known unknown. The Medical field has lots of “IDEAS” about what causes an infant to “suddenly die”. BUt NO ONE KNOWS for sure. Scaring new parents into buying the useless sh*t because of fear of SIDS is the best marketing scheme since packaged beard. Babies dies, sometimes that death is SUDDEN. The exact reason for the death is UNKNOWN. kudos for creativity. I would definitely add an lcd display to get an actual reading. Fair play to you. Found out recently that we’re expecting and I’ve been trawling the web looking for cool funky home-brew ideas to geek the nursery up! The angelcare ac401d is a pretty cool system that takes care of this side of things(remote receiver with temp gauge), but if anything you’ve done here, is that you may just have started a trend of geeking the nursery! c’mon dads and dads-to-be… get inventing! Sarah Hrdy did some research into SIDS, and found that something like 75% of “SIDS” cases were actually infanticide. Don’t know how an AVR’s going to prevent that, tho. Ummm, my parents didn’t have any fancy gizmo’s to gadgets to protect me. And I’m still here. Babies are way tougher than most people would think. What would I add – how about smell monitoring? Of course the baby will provide a lot of that monitoring and alarm function itself. But if you could work out something with a gentler alarm that would notify you before the main alarm sounds. In my opinion, and yes I’m a dad as well, all this SIDS stuff is just to scare the heck out of new parents and scrub some more money from them…. Just thing logically. Move to some more hot places, more southern. There, all this rules of the perfect temperature will not work at all. At the moment I’m just sitting here in a country with 34 C and a humidity close to 100%. And guess what… they have a lot of healthy babies here. And SIDS is the same or (luckily) less an issue like in all other developed countries. As far as I know, all this heavily overpriced baby alarms didn’t proof (scientifically) at all that they might prevent SIDS. Don’t be a fool and jump on some advertisement campaign. I know people believe to think … “for my kid only the best” but believe me there are hundred of thousands other possibilities to spend your money for your kid. Just to make it not OT…. I like the idea and the construction of the hack. I can only partial share the idea that a commercial design is more save. Over the last 3-5 years I had an enormous amount of wall-plug power converters and cheap electronic melting down and dying. This really becomes significant. Don’t tell me that this cheap no-name stuff is more save then a home-made solution. Did you ever open such a thing? It scares the heck out of everyone who is aware of Ohms law. And yes even if you buy expensive stuff you could bet that at least the power-converter is again a cheap no-name product from China. [Shakes head]I’m not one to pass of safety/security concerns, but… Nemo is correct, a failure of this device as designed, doesn’t but the child at any greater risk, than the child would have been previously. Like most warning devices, it’s assume it’s an adjunct to other monitoring practices. Personally I feel an audible alarm would be best. Doesn’t have to scream like a fire alarm in the baby’s room, but would be a good idea to have an audible alarm in the parent’s room sufficient to wake them up. Any fire hazard posed, most likely is no greater than electronics cased in thermoplastic enclosure. Taking stated figures(at jaycollet & here in the comments) at face value; 75% of 25% of births end in infanticide? That’s an incredibly high number. I built a semi-permanent rectal thermometer for added monitoring. The Arduino wraps around the baby’s leg and there is a probe going up it’s a$$. I hope to modify it to monitor flow control and viscosity in the future. @ D_ where the hell did you read that SIDS happens to 1/4 of babies born? If it is true it certainly is news to me and I’d suggest it needs to be fact checked against different sources. also you trolls that are saying that a temperature controlled color LED could be dangerous need to think. its not like this is mounted to the babys head. Our kids sleep with us, our recently born son and our 3 you daughter. Sleeping with the parents reduces the risk on SIDS. No need for electronic monitoring etc. Personally, I think it’s the best option. Or to paraphrase something I read sometime ago: if one carries a child for 9 months inside the body why put it away in its own room immediately after birth? Also, it makes breastfeeding way easier, no need to get up etc. My first will be here any day now and I was in the same boat. php counters , IR webcam, arduino light/temp deal. now that I am on the last few weeks. i just want to see my son. most of the stuff i did at first has been reused for other stuff (reef tank) etc. Plus it discourages the production of additional kids that you have to monitor lol. Win win situation. I think it is a nice project for fun and certain peace of mind. I also had my baby recently and my wife and I read tons about that. The monitors are sort of lame. Some false alarms, plus, when the monitor detects that the baby stopped breathing, it is anyway too late already. – use common sense in other areas (no blankets, loose clothes, etc. It is believed that the SIDS can be causes by accumulation of CO2. The infant body high CO2 “detector” isn’t mature enough to properly react to a high level of CO2. In other words, the baby won’t be able to move or wake up to reposition himself when CO2 is high, until his brain matures. Bottom line: very nice project (for fun), use common sense and safety measurements, make sure the baby sleep facing up, well air the room, and most important, enjoy this beautiful age. Congrats for your baby! @Sam, what world are you from? This is a large thermometer. It sits in the same room as the child, not in the cot or as a toy to be played with. The baby would never come in contact with it and it’s no more liable to cause a fire than any other powered DIY project in your house, so on that token you might want to stop ever doing any DIY projects just in case. Seriously, I’m all for testing and ensuring things are safe within reason, but the key here is within reason. An adequately fused and protected PSU should prevent fire, it’s a cold project (there’s no hot items) and all it does is provide information. There’s safe and there’s paranoid. I trust my DIY a lot more than most off the shelf items simply because I try to think of anything possible going wrong. Often with retail items they think of what they need to add to the product to get it to pass good enough to make it to retail. Don’t trust brand names either unless you are 100% sure they are the ones that actually make the product. subbing out work is bigger than ever. On your project I might would add a piezo buzzer as an indicator should the temp go far above an upper limit that exceeds 74, maybe 80F to let you know that things are really not right. I’m doing that with my aquarium. If something with the new digital control fails and it exceeds my limit then the buzzer will sound letting me know something is out of whack. I’m also aware of a number of cases of “approved” wall warts that have no line filter despite the approval requiring it, best case scenario this upsets your router. Worst case…something more critical can’t deal with the noise. I am the eldest (that’s right, eldest!) of eight so I do have some xp regarding bebes and their/parental needs. the temp sensor is a good idea, although an alarm for da ‘rents should be remote, not next to the young one(s). why not add one of those neato remote mics too (otherwise known as baby monitors), for when lil y’all needs to eat or is bored and wants to see you again? also, the smell sensor idea is genius! i certainly don’t want to lay in my own waste, and not being able to communicate that fact well would really frustrate me, so it occurs to me that having smell-o-vision would really lower the incidence of toddler/teen angst. a humidity sensor is a good idea too, and livin’ down south i can tell you that teh dust mites get particularly busy given certain temp/humidity ratios. and lastly, it is logical that sleeping with one’s parents provides comfort and accessibility, and would help the developing bebe’s nervous system recognize that being in the dark does not equal being abandoned, which I believe is the real cause of “that which must not be named”, no? How long to keep master or mistress child(ren) in bed? i’d say 9 mos…. Sam, if a toddler were to stick it’s fingers in a plug socket it would be killed, that doesn’t mean that you should remove all danger from the toddler by taking the plugs away.